The average career of a player in the NFL is 3.7 years. Chad Greenway was drafted in 2006, missed his rookie season due to an ACL tear, but has been a lock at the positon ever since. We have watched him grow from the rookie, to stud linebacker, to the vet and 11 years later, he retired a Viking great. Greenway was a special part of this defense over the years, he was the leader and as of lately an on-field coach to the younger upcoming guys. A guy Zimmer leaned on in the locker room. Towards the end of his career though his physical abilities obviously had decreased, his knowledge and mental aspect of the game were as good as they come. In an ever-changing game, and despite playing an Average of 14 snaps per game over the past 2 seasons, Greenway rolled with the punches, never complained, and did his job. Later in the season, teams looked to force the Vikings into their 4-3 base defense in critical situations, and would target greenway. It was hard to watch someone who had been so reliable in the past, be a liability at times. With 3 receiver sets growing in the NFL every year, the Base defense in the NFL is no longer a 4-3 or a 3-4. It’s the Nickel package. Where a linebacker is replaced with a corner to guard the slot receiver. In a 4-3 scheme, it essentially becomes a 4-2-5. In a 3-4 scheme, it becomes a 3-3-5. In 2008 teams were in the Nickel formation only 43.4% of the time. It has grown every single year since then. Last year the NFL average was 67.2%. For the past 3 years the Vikings were fortunate to have one of the better slot corners in the league in Captain Munnerlyn. During his tenure with the team, Captain only missed one game. And with this position slowly but surely becoming a priority to NFL teams throughout the league, the Vikings have had the luxury of not worrying about solidifying this position, until now. This offseason Munnerlyn decided to return home to Carolina to play for his former team the Panthers. So where do the Vikings go from here? Mike Zimmer recently said that Mackensie Alexander, the Vikings 2016 second round pick, will have the first crack at the position. Alexander was thought to be a first round pick by many. At Clemson he was considered a shutdown corner on the outside. According to PFF College Football, in 2015 he was only targeted 20 times all year giving up 7 receptions for 104 yards. Between his two seasons (2014-2015), he had zero interceptions, only 11 pass break ups and only allowed a total of 19 receptions. Teams were concerned with Alexanders lack of Interceptions and pass breakups but it was simply because he blanketed number one receivers and quarterbacks were weary of looking his direction. However the slot corner position is a tough transition from the outside but Mackensie has all the tools for the position. While he stands at 5’10 190 pounds, he is known for playing bigger than he is. He ran a 4.47 at the combine, has fluid hips with little wasted motion. He needs to work on his footwork coming off the line but he excels in man coverage but can struggle in zone schemes. Through his success he was isolated by himself and was offered little help underneath or overtop during his days in Clemson. He has all the confidence in the world which you need at the position. (see Alexanders Combine Interview). Some speculate he was drafted specifically to replace Captain and barring a free agent signing the team is most likely looking at two different options in the secondary. Rhodes and Newman on the outside, Alexander in the slot, with Wayne’s as the rotational guy on the outside. Or if Alexander is not ready, Rhodes and Wayne’s on the outside, with Newman in the slot. A tough task for a guy who is 38. So, what about Replacing Greenway? Not a tough task to find a guy to contribute roughly 15 snaps a game. But with the majority of those snaps coming on short yardage/goal line situations, you need the be able to count on them. The way Zimmer arranges his defense, he tends to switch up the WILL and Sam linebackers. In his defense The WILL linebacker acutally plays on the offenses strong side stacked behind the 3-tech defensive tackle. Then Barr(the SAM linebacker) is put on the offenses weak side depending where the tight end is lined up at. Currently the Vikings have Edmond Robinson, Emmanuel Lamur, and Kentrelle Brothers to compete for the position. Edmond Robinson was drafted in 2015 by the Vikings in the 7th round. At 6’3 245 he has the build of your typical WILL linebacker. While also running a 4.61 at the combine, he has the athleticism you want for a guy on the perimeter. He played D2 football but didn’t excel against the lower competition levels. He needs to add strength but his ability to move in space is what intrigued the Vikings into selecting him with every intention of giving him time to develop. Though he’s shown flashes of his potential, he can often be a liability in coverage. Emmanuel Lamur was a player who earned his spot on the Bengals roster through a tryout at the 2012 rookie mini-camp, playing for two seasons under Zimmer previously, Zimmer brought him along to Minnesota last year. At 6’4 235 and a 4.63 40 time, Lamur also has the prototypical size and speed. However, he has had trouble with knee and shoulder injuries over his career that held him back and caused him to lose his starting role with Cincinnati. He has long arms and wraps well through contact, a solid tackler, but struggles in the run game. Once a safety at Kansas state, his strength is in coverage. Though you can often find him taking false steps on reads, he has cleaned up a lot of his footwork and angles. Then you have Kentrelle Brothers, the Vikings 2016 5th round pick. Brothers a former second-team ALL American, stands at 6 ft tall weighing in at 245 pounds and was a tackling machine at Missouri. He has elite instincts, reads his keys well as plays develop but is heavy footed and clocked a 4.89 40 time. Not quite the speed you want for a guy on the edge. Add that along with his short frame and arms, he doesn’t fit your typical WILL build. While he would be a solid fit in the middle, its hard to envision them moving Kendricks to the outside. At this point Brothers is more of a depth guy rather than a starting outside linebacker. So, while these two positions co-exist today in the NFL, the Vikings might already have their replacements on the current roster. However, if the Vikings were to look towards the draft to add help, what are their options? In a defensive class this deep, Mike Zimmer is probably itching to get his hands on quite a few of these guys. He loves his corners and believes you can never have enough of them. Lucky for him this is one of the deepest cornerback classes of the decade. PFF has 18 corners listed on their top 100 board, while others have as many as 24. This means the Vikings can likely get quality talent at the position in the 3rd/4throunds. But if they choose to take a corner earlier, it won’t be a good sign in their confidence in alexander. But if there’s anything we know about Mike Zimmer’s philosophies, he doesn’t ask his rookies to do much at the cornerback position. He wants to give them time to develop and when he feels they understand their job, he gives them chances to prove their ready. Expect them to draft a corner for depth and to learn. As far as linebacker, PFF only has 4 ranked in their top 100, Only 12 in the top 200. Others have as many as 7 in their top 100, and 13 in their top 200. Not a deep class to say the least. Especially for guys who fit the Outside linebacker mold. Two top guys who fit the Vikings should they fall are Rueben foster whose stock is dropping due to off field issues and injury concerns, and Zach Cunningham who has been projected as high as 18 and as low as 51 in most mocks. But is OLB really a priority for the Vikings at 48? Are 15 snaps a game worth a high draft pick with so many other needs in the trenches? Do the Vikings take Best Player Available, or Best Player Available at a positon of need. We are days away from finding out. But look for the Vikings to go elsewhere at 48 and grab their guy in the later rounds. Though Zimmer has been tough on his rookies, the linebackers have been the ones he’s leaned on early(Barr, Kendricks). A few names to keep an eye on in the middle rounds are Duke Riley, Blair Brown, and Elijah Lee. 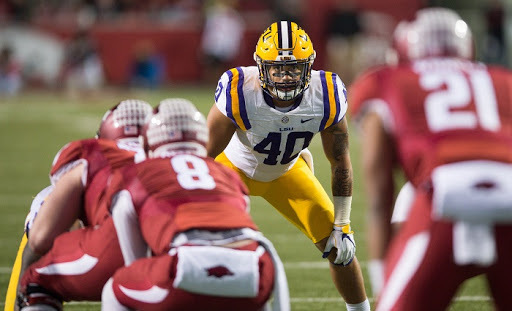 Duke Riley from LSU was a late bloomer, bursting on the scene as a senior. He has limited starts under his belt but took full advantage. Leading the team with 93 tackles, 9 for loss, 1.5 sacks and an interception. He stands at 6′ ft weighing 232 pounds. Ran a 4.58 40 time. While Riley’s straight line speed is intriguing, he’s not exactly a freak athlete. He struggles against running backs out of the backfield, can struggle getting off blocks, and has a lot of learning to do in the second level. He does however burst through gaps, diagnose zone reads, and blow up plays underneath with ease. Riley has a lot of untapped potential. He has a lot of similarities to Eric Kendricks in not only his play style, but his build. They both have identical height and weight coming out, Riley just a little faster (Kendricks 4.61) Expect riley to go between late 2nd-late 3rd round. Blair Brown from Ohio has built up a lot of steam around his name as of late, leading the team with 128 tackles, 15 for loss, 4.5 sacks, and 1 forced fumble. At 5’11 238 pounds, Brown ran a 4.65 40 time. He plays with the urgency you want from a linebacker at the NFL level. Very instinctive, trusts his reads as plays develop, and gets to the line of scrimmage quickly. He closes in on gaps and drives through his blockers. He ranked number 1 in all FBS in tackling efficiency. While he excels in the run game, he is a liability in coverage. The last two season he has ZERO passes defensed. He tends to underestimate speed to the outside and take poor angles. He can get lost in zone coverage underneath. His coaches at Ohio praised him for his ability to learn and while athletically he has all the intangibles, he’s definitely going to need some coaching. Expect Blair to go in rounds 4-5. Elijah Lee from Kansas state has received the most attention from the Vikings. After receiving first team All BIG 12 honors, Lee somehow did not receive an invite to the combine. He drew attention from MIN, MIA, LA Rams, LA Chargers, NYJ, ARI, WASH, ATL, PHI, TB, SEA, DET, SF, JAX, CAR. 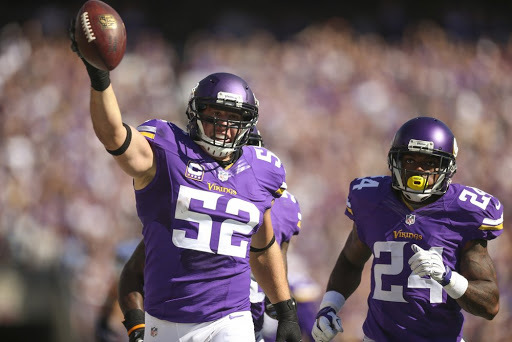 Lee recently stated the Vikings had shown the most interest in the Linebacker. Lee stands at 6’3 228 pounds and Ran a 4.72. A real rangy Linebacker, who closes in on the line quickly. Has the quickness to get to the outside and cut guys off on the edge. Takes correct angles and excels in space. Meets running backs at the hole, and though he’s light in the weight department, he’s shown when he uses his hands correctly he can get off blocks quickly. He does need to add some lower body strength in order to succeed. He tends to wrap and throw/drag guys down rather that wrap and drive. Would like to see him use his shoulders more. But he’s the most intriguing prospect out of these three because of his potential. He has the highest ceiling and we’ve see what Zimmer is capable of doing with helping Athletic guys put it all together. Expect lee to go in the 4-5th rounds. With all this being said, there is one guy who is the ultimate wild card Jabrill Peppers. At Michigan, Peppers played Safety, Corner, Linebacker, Running back, and was a return man. Though he has been listed as a “master of none’ hybrid, its his versatility that makes him an intriguing prospect for the Vikings. At 5’11 215 pounds, Peppers build will allow him to come in at WILL linebacker in sub-packages. Add that with a 4.46 40 time, he has the speed you want for a guy on the perimeter. He can line up and guard slot Receivers, and play safety. He excels running spys on running backs and quarterbacks. He has all the desired traits you want for a guy who will play in space. He flows from sideline to sideline with fluent hips. He is capable of blitzing off the edge, or on a stunt. Like Mackensie Alexander, a lot of questions flowing around Peppers are based off his lack of ball production. With only 10 passes defensed and 1 interception, he does need work in coverage, but its still interesting to see what Zimmer could do with a guy like him. Expect him to go late 1st-Mid 2nd.